Unlike previous two years, the year 2017 could not saw a significant reduction in anti-State violence. Instead, the year saw more suicide attacks than previous two years. An Independent think tank Pakistan Institute for Conflict and Security Studies which also works as a monitoring body of anti-State violence in Pakistan has released provisional statistics for the year 2017 which show around 15 percent decline in militant attacks, a mere six percent reduction in deaths in militant attacks and a four percent increase in number of injured. The year saw 23 suicide attacks, which is more than previous two years (2015 saw 18 and 2016 saw 17 suicide attacks). This so-called status quo in security situation in the year could be attributed to various external and internal factors including renewed support to anti-Pakistan elements operating from Afghanistan and the government in Islamabad losing focus of its counter-extremism strategy, i.e. 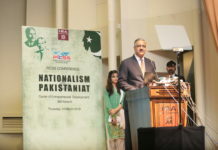 National Action Plan, due to political maneuverings of the opposition parties resulting in ouster of the sitting prime minister. As per statistics released by the PICSS, 1387 people were killed including 585 civilians, 555 militants, and 247 security forces personnel while 1965 people were injured including 1580 civilians 331 security forces personnel and 54 militants in terrorism-related violence including militant attacks and security forces actions. The militants carried out at least 420 attacks in which 912 people were killed including 584 civilians 225 security forces personnel and 103 militants and 1877 people were injured including 1576 civilians 271 security forces personnel and 30 militants while security forces conducted 522 actions in which 475 people were killed including 452 militants and 22 security forces personnel while 88 people injured including 60 security forces personnel, 24 militants, and four civilians. Security forces also arrested 1760 suspected militants during the year. 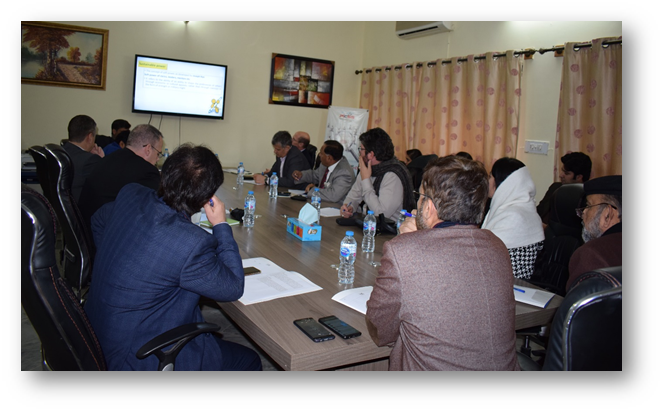 The year also saw a significant decline in the number of security forces actions against the militants, resultant deaths, and arrests of the militants. 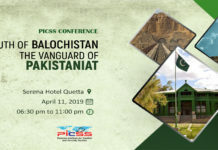 As per PICSS data, the year 2017 saw a decline of 113 percent in security forces actions, a reduction of 87 percent in militant deaths and 139 percent in the number of arrests related to terrorism. Despite a remarkable decline in security forces actions, the total number of militant attacks remained less than last year. The year 2017 saw the highest number of militant attacks in Balochistan where 183 militant attacks were recorded in which 308 people were killed including 208 civilians and 84 security forces personnel while 572 people were injured including 443 civilians and 129 security forces personnel. The province saw almost no change in the total number of militant attacks, however, a decline in the number of deaths by 46 percent and injuries by 28 percent was observed. The province remained a target of a variety of militant groups including sub-nationalist militants, sectarian and international militant groups. Overall, 43 percent of the total militant attacks in the country were recorded in Balochistan. 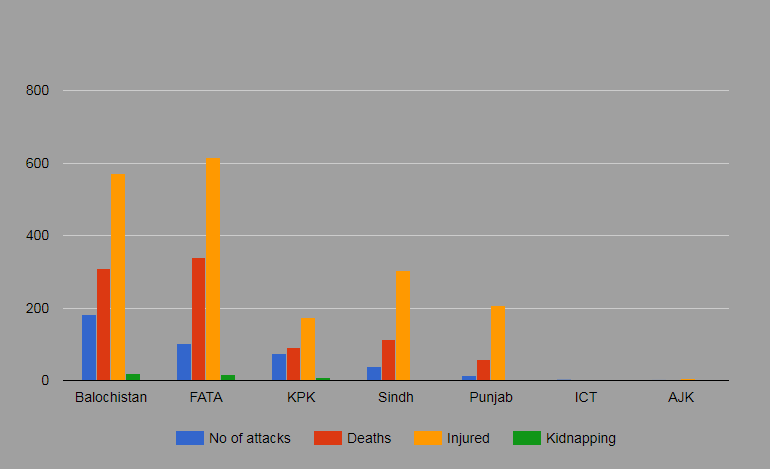 10 out of 23 suicide attacks (43 percent) took place in Balochistan during the year. 46 percent of the IED blasts (bomb blasts) also took place in the province. In response, the security forces conducted at least 134 operations against the militants in which 112 militants were killed and 657 were arrested during the year. After Balochistan, FATA remained the most troubled part of the country during 2017. Although the number of militant attacks dropped by 14 percent, the number of deaths increased by 77 percent and injuries by 152 percent. Kidnapping by militants also increased in FATA by 113 percent. In total, 102 militant attacks were recorded in this region in which 339 people including 206 civilians, 65 security forces personnel and 68 militants were killed while 858 people including 629 civilians, 187 security forces personnel and 38 militants were injured. 58 security forces operations were reported from FATA in which 84 militants and five security forces personnel were killed while 22 militants and two forces personnel were injured. Security forces also arrested at least 79 suspects from FATA. Khyber Pakhtunkhwa witnessed significant improvement in security situation as all indicators saw negative trends. 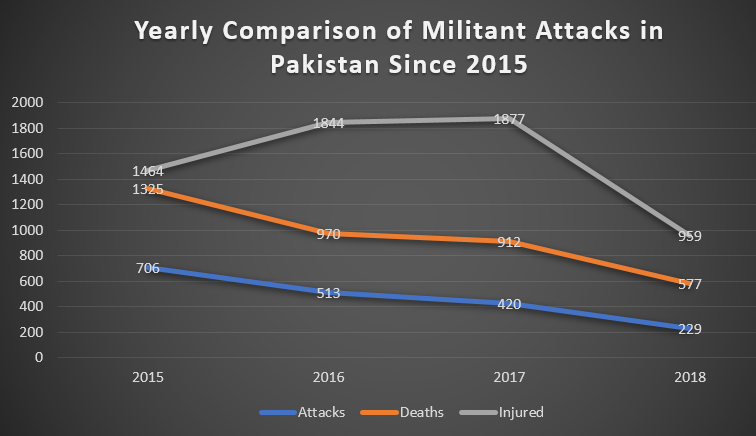 There was 40 percent decline in the number of militant attacks, 47 percent decline in the number of deaths 55 percent decline in the number of injured. A total of 75 militant attacks were recorded in KP in which 92 people were killed including 43 civilians, 34 security forces personnel, and 15 militants while 175 people were injured including 136 civilians and 39 security forces personnel. 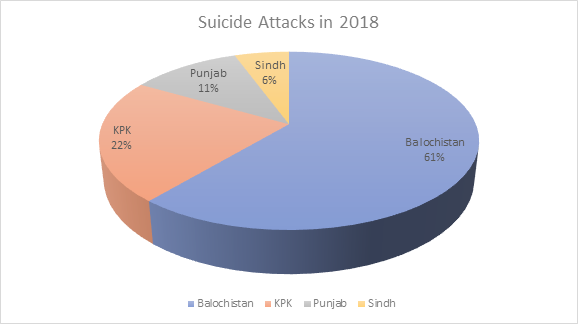 Despite the overall improvement, the province saw the second highest number of suicide attacks during the year as there were at least six suicide attacks reported from the province. (In 2016, there were five suicide attacks recorded in the province). Security forces conducted at least 103 actions against the militants in which 543 suspects were arrested and 41 were killed during 2017. Sindh province saw a 40 percent decrease in militant attacks, however, there was 84 increase in deaths and 142 percent increase in the number of injured in militant attacks during the year 2017. Militants carried out 40 attacks in the province in which 112 people including 92 civilians and 17 security forces personnel while 303 people were injured including 293 civilians and 10 security forces personnel. The province saw one suicide attack during the year. The security forces conducted at least 98 actions against the militants in which 110 suspects were killed and 153 were arrested. Punjab witnessed seven percent increase in militant attacks however there was 37 percent decline in deaths and 41 percent decline in the number of injured persons. During the year, 15 militant attacks were recorded in Punjab in which 59 people including 34 civilians and 24 security forces personnel were killed and 208 people all of them civilians were injured. The province also witnessed three suicide bombings which are one more than 2016. The security forces conducted 119 actions against the militants in the province in which 105 militants were killed and 298 were arrested. Two militant attacks were reported from Azad Jammu and Kashmir in which one civilian died and five injured. Three violent militant activities of low intensity were reported from Federal Capital Islamabad in which only one person lost his life. No violent militant activity was reported from Gilgit-Baltistan region. The security forces conducted at least four actions in Azad Kashmir in which 12 suspected militants were arrested. 14 suspected militants were arrested in the Gilgit-Baltistan region in two security forces actions while four suspects were arrested in three actions in Federal Capital Territory Islamabad. Suicide attacks as the major tool of militants fighting against the state.